Not everyone is going to dance and if they do, it likely won’t be all at the same time. Even if you’ve invited 300+ guests, not all of them will be on the dance floor unless you’re only related to and friends with people who love to dance. Take a quick inventory of your guest list and if you think you’re really inviting a group of people who need a ton of space to dance, then we can work together to make sure your dance floor is adequate. Otherwise, we recommend a smaller space. Big dance floors can actually be scary instead of inviting. Not all your guests will enjoy being seen dancing in front of lots of other people. If you’re dance floor is too big, it’s going to feel empty and will likely deter the shy ones from getting down. A smaller space looks more full and is much easier to slyly sneak onto, without anyone really noticing. When you put this into perspective, would you book a room that fits 500 people if you’re only inviting 200 people? Keep the energy buzzing with a smaller dance space. Do you really need a huge dance floor? Unless you have a troupe performing a number, the type of dancing you’re doing will most likely not require a ton of space. 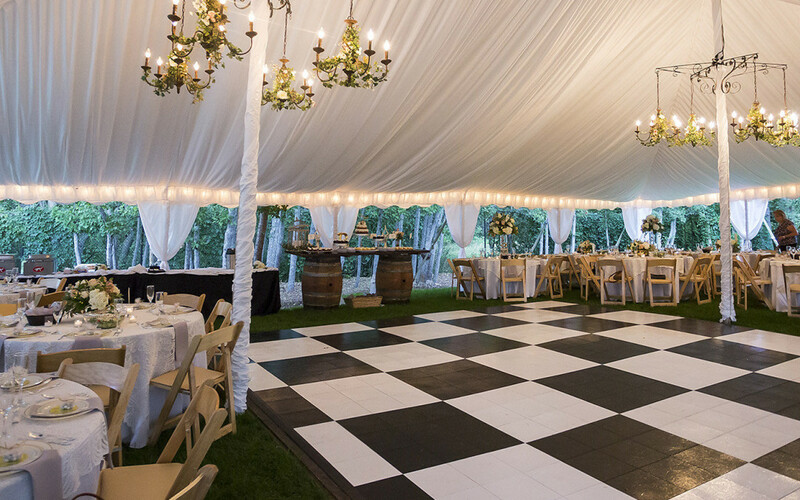 The beauty of working with Benson Tent Rent and renting for your wedding is that we can customize your dance floor. Based on your guest list, we can work together to build the perfect size space. If you have questions or are ready to start planning your wedding, give us a call!